I always try to use products for a period of time before writing about them on the blog but I think I’ve tested out the essential oils for the longest before reporting back about them. I really wanted to see how the oils fit into my life and if they were really as amazing as everyone says. Now, to start, I’m not selling the oils nor do I intend to, and there are no affiliate links in this post so I’m not making any money off of talking about them. This is just my honest opinion of what I’ve been using, how I like it, etc. Okay good, that’s out of the way. Honestly I had been a pretty big oil skeptic for a while and was pretty adamant that they were NOT for me. But over time my opinion began to soften a bit, mostly because I was starting to gravitate toward natural products in general, and I’d see friends posting about their oils and so on, and it started to catch my attention and pique my curiosity. I knew I wasn’t going to be one of those “there’s an oil for everything” type person, but what i was hoping for was that they’d be an addition to our daily life that just fit in nicely. And that was really my goal when I got my Young Living kit. I started out with oils that I knew I could understand: peppermint, lavender and lemon. Easy, right? 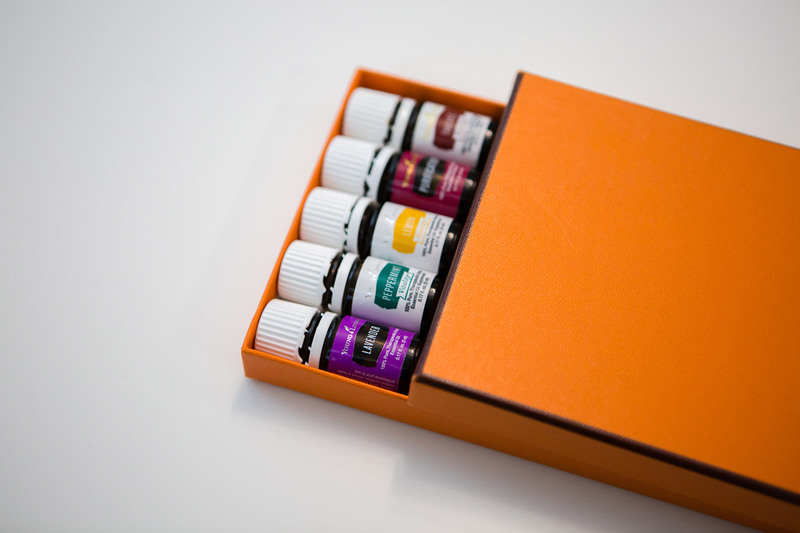 The easiest way for me to integrate oils into my day was by diffusing. 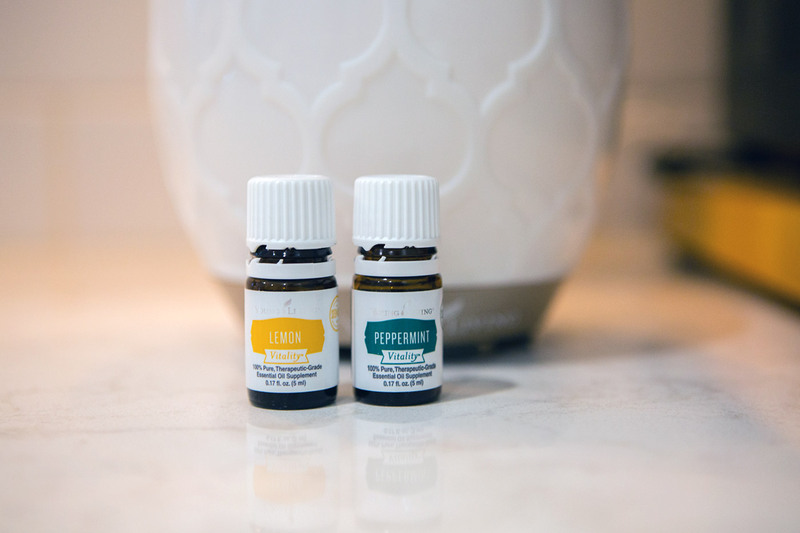 I would do peppermint (or peppermint and lemon) in the mornings in the kitchen and then move the diffuser up to my office after the boys went to school and I started working (I actually probably just need two diffusers). It was fresh and light, especially in these gray winter months, and I just liked having it on. It woke me up and created a sort of happy feeling in whichever room the diffuser was in. Then at night, about 30 minutes or so before we went to bed, I’d start diffusing lavender in our bedroom and I swear it really did lead to better sleep! I later ended up putting it in a spray bottle and spritzing our sheets after I’d turn down the bed and it just felt nice and calming. When we were sick in January, I was given tips to diffuse a couple of combinations: peppermint, lemon and lavender (also known as the allergy trio) and then taking that combo and adding Thieves to it. Personally, I liked it better without the Thieves, but I know everyone raves about that one, so I had to give it a shot. And more recently, I’ve found that I really like Purification. Because we cook so much, our house can end up with a combination of smells that doesn’t always go that well together. So after we cook dinner I’ll diffuse Purification (until I take the diffuser back upstairs to start my lavender – see, I need another one!) to help clear things up. So far, I’m a big fan of this one! Like I mentioned, we got sick in January and I found a few more ways to try the oils, some I liked and some I didn’t. I thought at first I’d take a natural approach to get rid of what I had, but it turned out that I had a sinus infection and ended antibiotics, so there are just some things that the oils can’t fix! I did a few drops of either lemon or Thieves (not at the same time) in the bottom of a steamy shower before getting in to help clear up my congestion – I liked this one and might do the same with lemon or peppermint in the mornings just to wake me up! Purification on the outside of my throat to help with a sore throat – I’m not sure this really did anything but it smelled nice and I felt like it helped, so I’m going to say it did. Gargling water with a few drops of Thieves – YUCK! Hated this one, but it came highly recommended so I did it. It did slightly help the sore throat but maybe I’m just not a Thieves person, sorry oil friends! Now that I’ve gotten into this, there are a few more oils that I’d like to try and ones that I will definitely restock. I’m due for a reorder of lavender, peppermint and lemon because I use those all the time. And I’d definitely restock the Purification when I need to because that’s been a good one for us. Otherwise, I’d like to try some of the blends like Citrus Fresh, Brain Power, Joy, Peace and Calming and Stress Away. I’d also LOVE to have the rose oil to add to beauty products and just because I’m sure it smells amazing, but it’s a bit pricey and I’m not quite that dedicated yet. If you’re an essential oil fan, I’d love to hear some of your favorites too! Please share some new ones that I should try or other uses you love either in my comments or over on Instagram, I really want to hear more! Great read! You have Stress Away in the kit you got 🙂 it’s the 11th oil. Shoot me a message on FB if you don’t find it in your kit. I didn’t have it! I’ll message you – thanks!